The Extang Classic Platinum Toolbox comes in standard or custom-cut for non-standard size toolboxes and offers fast, easy access to truck bed & cargo by simply dropping tailgate or by rolling up the tarp. Fits With Existing ToolBox Fits most standard 18-20" size toolbox. L-Channel: Perfect Fit Patented L-Channel design and adjustable sealing system easily bridge the toolbox-to-tonneau gap. Engineered For All Climates Extang makes the only 4-way adjustable tonneaus. Simply position snaps at the appropriate weather setting for the perfect fit. Long Tarp Life Perfectly sewn with special anti-curl corners, plus a thick polymer backing provides long durable tarp life. Premium Metal Design Heavy-duty anodized aluminum rails and monster bows make it an ultimate tonneau choice. *Toolboxes Sold Separately. 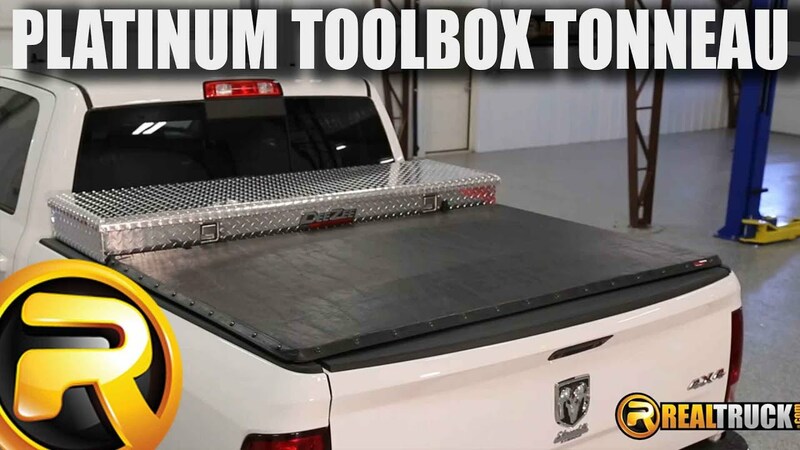 The Extang Classic Platinum Toolbox Tonneau Cover is an ideal solution for trucks already equipped with a tool box. They are custom fit and will form to most standard tool boxes. Get the same great protection as with other Extang truck bed covers, with the advantage of keeping your toolbox. Also, these tonneaus come in custom cut designs, fitting non-standard tool boxes. They feature a one-handed tail rail which offers a quick release as well as snaps that are made of indestructible brass. The monster bows give added support and keep the tough vinyl tight in all weather conditions. The Extang Classic Platinum Toolbox tonneau cover can be installed on your pickup in minutes. It has an easy clamp on installation. Each product comes with easy to understand vehicle specific installation instructions. Extang covers the Classic Platinum Toolbox Tonneau Cover with a lifetime warranty on the frame and a 10 year warranty on the vinyl cover.